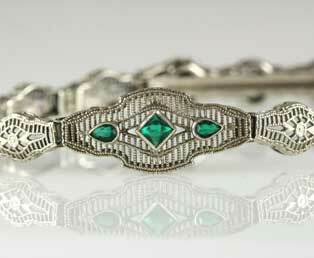 This estate Art Deco filigree bracelet is adorned with dark green emeralds. The center panel of this bracelet has one dark green square emerald with two smaller pear shaped emeralds extending from the center. This die-struck bracelet has thirteen links that each have a centered flower design. This 14kt 585 white gold bracelet has a secure clasp that opens at the back of this bracelet and prevents this bracelet from being completely open. A safety bar is concealed by a flower at the back of the bracelet. After lifting the flower, a bar extends to allow you to place the bracelet on your wrist. Two pear shaped teardrop dark green emeralds and one center square emerald, all three synthetic as to be expected for the 1930s. Excellent condition, some patina is visible, may be polished upon request.